Arianespace marked another mission accomplished for science as its medium-lift Soyuz successfully launched the European Space Agency’s Gaia billion-star surveyor today from the Spaceport in French Guiana. Named for the Greek mythological Mother Goddess, Gaia is now beginning an ambitious mission to chart the largest, most precise three-dimensional map of the Milky Way galaxy. Liftoff! Soyuz begins its ascent as shown on Arianespace’s launch broadcast, carrying Gaia on the Russian-built launcher’s sixth mission from the Spaceport. Lifting off at 6:12:19 a.m. local time, the flight marked another successful Arianespace mission across its complete launcher family – underscoring the reliability and availability of the company’s vehicles from the heavy-lift Ariane 5 to Soyuz and the lightweight Vega. For Soyuz, this was Arianespace’s sixth mission with the Russian-built vehicle from French Guiana since its initial Spaceport flight in 2011, as well as the second launch this year following June’s orbiting of four O3b Networks satellites. The company’s Starsem affiliate also lofted six Globalstar spacecraft with Soyuz from the Baikonur Cosmodrome in February. 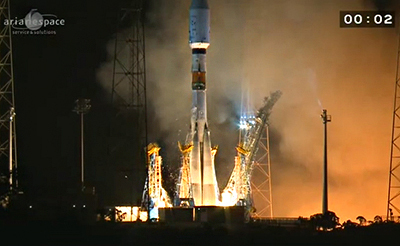 In citing the Soyuz program’s key Russian participants – including the Roscosmos Russian federal space agency, launch vehicle prime contractor TsSKB-Progress, and Fregat upper stage designer/manufacturer NPO-Lavochkin – Israël said they form “a ‘dream team’ that is the heart of the successful partnership between Russia and Europe, which began more than 17 years ago” with Arianespace’s Starsem affiliate. Arianespace’s early morning Soyuz flight with Gaia provided excellent views of the workhorse launcher’s staging and its payload fairing separation as the vehicle proceeded downrange. The workhorse launcher performed a powered phase of its three lower stages, and two burns of the autonomous Fregat upper stage to deploy Gaia, which had an estimated liftoff mass of 2,034 kg. 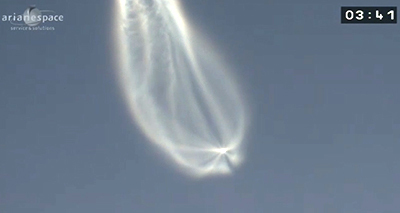 and was released 41 minutes and 59 seconds after liftoff. Produced by Astrium for the European Space Agency (ESA), Gaia has a 5.5 year design life and will operate from the L2 Lagrange point 1.5 million kilometers from Earth. The spacecraft contains two optical telescopes that work with three scientific instruments to precisely determine the location and velocities of stars, and split their light into a spectrum for analysis. Gaia will observe each of its targets approximately 70 times during its mission, mapping an unprecedented one percent of the Milky Way’s 100 billion stars. It is also expected to discover hundreds of thousands of celestial objects such as asteroids, newly formed stars, stellar explosions and black holes. With today’s mission, Arianespace has now orbited a total of 25 spacecraft dedicated to science. Soyuz Flight VS06 also continues the company’s strong relationship with ESA, for which it has launched 40 payloads. This includes three missions in 2014 across Arianespace’s entire fleet: the Vega flight in May with Proba-V and June’s Ariane 5 orbiting of the ATV Albert Einstein, as well as Gaia. In reviewing Arianespace’s 2013 activity, Israël noted the year has been fully successful for its launch vehicle family, which he described as reaching unrivalled heights in terms of reliability, availability and quality. Israël added that 2013 also was a banner year in terms of commercial orders – with 15 satellites won for Ariane 5 launches to geostationary transfer orbit, and four satellites booked for Vega. In parallel, Arianespace ensured continuity by ordering 18 additional Ariane 5s and 10 more Vega launchers in 2013, while also strengthening its competitive position with a program to increase Ariane 5’s payload fairing volume, along with obtaining the go-ahead for a new Spaceport fueling facility to increase the company’s ability in preparing satellites and managing more launch campaigns in parallel. Powered by its first and second stages, Arianespace’s Flight VS06 Soyuz climbs away from the Spaceport in this wide-angle image. In opening its 2014 mission manifest, Arianespace will turn its focus to Ariane 5. The next Spaceport mission – designated Flight VA217 – is set for January 23 with two telecommunications spacecraft passengers: ABS-2 for ABS; and Athena-Fidus for Telespazio, on behalf of the French CNES and Italian ASI space agencies. This will be followed on February 19 by another Ariane 5 dual telecommunications payload mission: Flight VA216, which is to loft ASTRA 5B for SES and AMAZONAS 4A for Hispasat. Israël concluded his post-launch comments with a tribute to the Arianespace team, especially all who contributed to today’s Gaia launch success – which occurred almost four years to day after the spacecraft’s launch contract was signed with ESA. “Your commitment and professionalism have once again proven to be at the heart of Arianespace’s success,” he added.